You can never have enough can you? AND buying storage is just so much fun! Because then you’ve got more lovely stuff to ram in your cupboards. When you can’t find its lid. We just need storage for our storage. That will fix it. Won’t it? For that oh-so-clever little hack. Because it wasn’t a storage problem. It was an Alice-you’ve-got-too-much-stuff-you-never-use problem. And I guess if you’re here and reading this. You’re in a similar boat. So today we’re going to let go of some kitchen storage we don’t need. Now we are trying to be quick. And only taking 5 minutes. 15 minutes max. And matching plastic tubs and their lids is not always quick is it? It’s why – like odd socks – they drive us crazy. So grab the obvious stuff you’re ready to let go. Put it in your charity bag. Or recycling. AND if you have got a load of tubs to match up. Pencil in a movie slot. With your fave seen-it-loads-feel-good film. And sort them, half watching the film. Great job for anything you let go. But for an extra nudge read on. There’s huge money made in storage solutions. I have handed over so much hard-earned money for them in my time. I genuinely believed I was solving a problem. Mostly, I was feeding my shopping addiction. 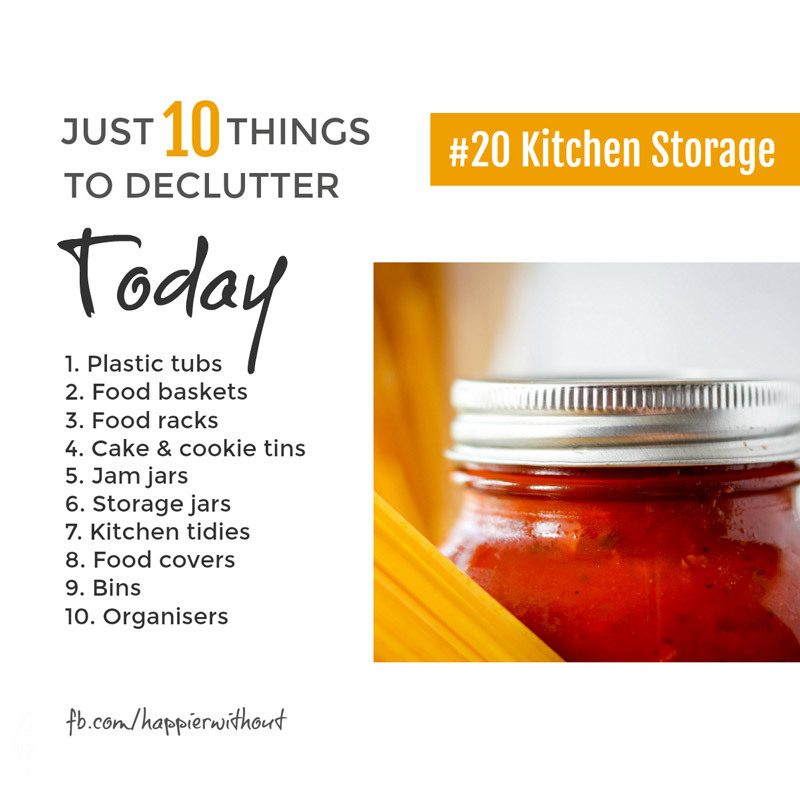 So whilst following just 10 things I’ve stopped buying storage. Full stop. You see just 10 things is a journey. And on that journey we’re going to free ourselves from more clutter than we ever imagined possible. AND create more lovely space. So don’t worry if stuff’s a tad messy short term. Don’t reach for that new “storage solution” to tidy them. Focus on letting go.